Earth Week 2015 at Oakton Community College–Events and Activities! Oakton Community College is gearing up for its annual Earth Week celebrations! From April 20-25, we invite students, employees, and community members to join in a variety of educational experiences centered on environmental awareness and sustainable practices. A number of our own Oakton faculty and staff will be presenting lectures and leading volunteer workdays. We have also invited a few representatives from community businesses and organizations to share their knowledge. All workshops and activities are free and open to the public (most will be held at the Des Plaines campus)! There will be plenty of hands-on experiences including: a bird walk, campus nature walk, Lee Center building tours, environmental restoration (garlic mustard removal), water quality and invertebrate sampling in Lake Oakton and prepping our community gardens. Municipal Water Cycle: What happens to water after we use it? Ecology Club will be on hand to sell milkweed and strawberry plants throughout the week and the Green Committee will provide snacks on both campuses. We will also be partnering with USAgain in a clothing, shoe and textile drive. Please visit www.oakton.edu for a full schedule and updated details as they become available! Categories: Campus Initiatives, Community Action, Leadership, Student Engagement, Volunteer Opportunity | Tags: Campus Events, Communications, Community, Ecology Club, Environmental Education, Habitat Restoration, Recycling | Permalink. 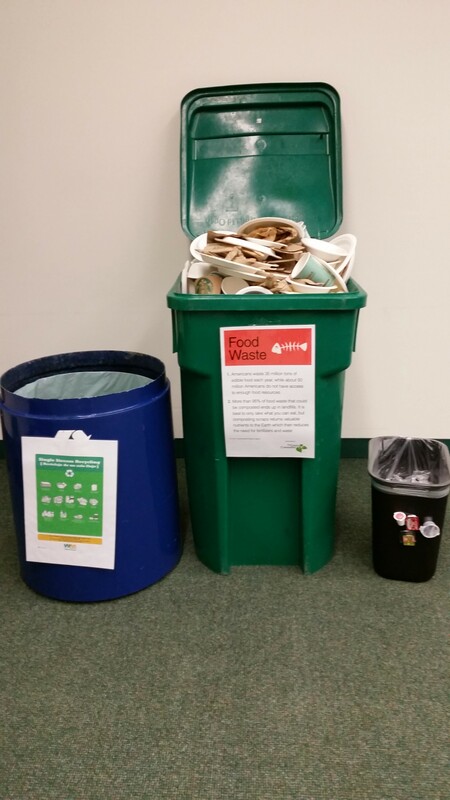 Oakton’s Staff–Going Green This Spring! We are so excited to have made Oakton’s annual Staff Day a near Zero Waste event! Over 300 Oakton staff gathered together on March 18 for a day filled with professional development, learning and networking opportunities. As part of the day, two meals and an ice cream sundae bar were provided. Together, the Staff Day Planning Committee and the Green Committee were able to reduce our impact and reduce waste in landfills by using all compostable serviceware and utensils for each of the meals at the Des Plaines campus. Bulk ingredients were used where possible and all beverage cans and food boxes were recycled. For a full day of service, only two small desk side waste containers were filled! This is one step to improving our sustainability efforts as a College. In addition to being near Zero Waste, we also held a number of opportunities for staff to increase their sustainability through building tours of the new Lee Center, an interactive workshop on Sustainability Tips for Home and Work and informational booths on salvaging and re-purposing items around the house. Categories: Campus Initiatives, Green Jobs | Tags: Environmental Education, Sustainability, Waste Management/Reduction | Permalink.